One Piece 850 Spoilers!!! One Piece 850 Prediction and Discussions!!! One Piece 849has been released now!!! Read it now!!! Chapter title is “Ray of light”. In Mirror World、Chopper tries to find Luffy and Co , but there are too many mirrors. Sanji goes to deliver the dish to Pudding. Luffy tries to escape even if his arms tear off. Pedro is fighting Tamago. Tamago asks him why he came back. Pedro strongly answers that Straw Hats are the only guys who can lead the world to dawn. Pedro slashes/bisects Tamago. The alive door prevents Sanji from entering the room. He has no choice but to go to Pudding’s location from terrace. When Sanji sees the inside of the room, he finds Reiju on a chair and 3-eyed-Pudding. Pudding sneers at Sanji(, whom she thinks is not near the room). Actually Pudding is one of Big Mom’s favorite and she is good at acting. Pudding was cheating Straw Hats. Puddding whispers something to Luffy. Pudding “I will shoot to kill that idiot, who fell in love with me as I expected, which is why I don’t get married. Blood is falling from Reiju’s leg. Reiju’s arms are constrained. Pudding “Mama wants clone soldiers and Germa science from the beginning. The whole Germa Kingdom lies at anchor on our territory. Thank you all you idiots for being invited to Sanji’s political party. Sanji shows an expressionless face listening to Pudding’s talk secretly in thunderstorm. – Big Mom is the only person who knows Pudding’s true personality. – When Sanji goes to Pudding’s room, one of the guards asks him if he goes out. Sanji answers, “I’m gonna go to be healed by a ray of light in this world” (chapter title). 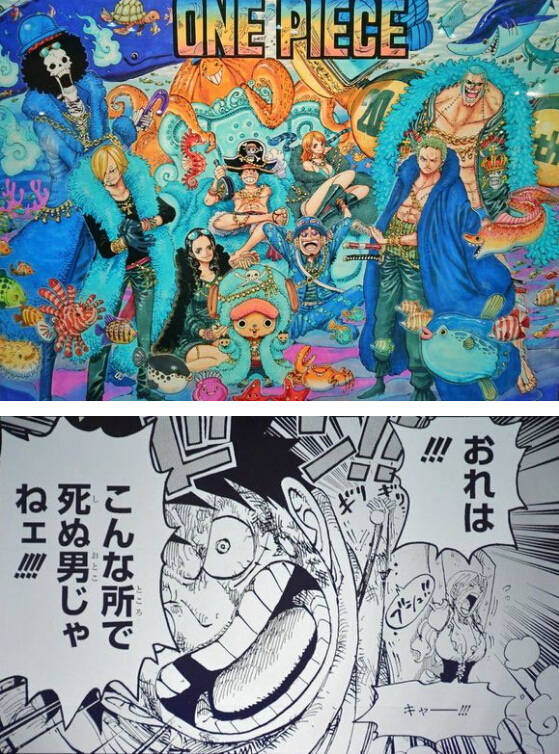 Luffy appeared in a Shonen Jump special, where Enel attacks Tokyo and Odaiba. Goku arrives to fight Enel and Luffy appears to help him. Luffy and Goku make an attack called “Gomu Gomu no Kamehame Ha” and they destroy Enel.